Did you know that the Santa that we know nowadays is very different from the Santa of old? The wholesome and iconic Christmas Saint has developed through the ages to the jolly fellow who we now know. Today, he is a mascot for kindness, happiness and Christmas spirit. Let’s take a look at his journey through history. The history of Santa Claus can be tracked to hundred of years ago to a man named Saint Nicholas. 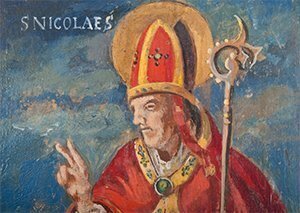 Most people think that Nicholas was born around 280 AD, though we can’t say for sure. A lot of people admired Saint Nicholas for his kindness. Stories were told about how he gave away his money and went around the world helping the sick and poor. One of the most famous stories about Saint Nicholas is that he saved three kids from slavery. Over time, he somehow became popular and known as the protector of sailors as well. He died on December 6th, a date that was celebrated and considered a fortunate day to make purchases and get married. The stories of this saint eventually made it to America and a newspaper noted that they were celebrating December 6th. The name of “Santa Claus” came from Nick’s Dutch nickname, Sinter Klaas, which then became the name we know today. Santa was depicted in many different ways. At first, he looked like an intimidating elf. Then, some sources say that he wore green and white, however, other sources say that he wore red and white. In 1822, Clement Clark Moore wrote a poem called “A Visit from St. Nicholas”, better known as “‘Twas the Night Before Christmas.” Sundblom, a painter, used this poem as inspiration and painted a new plump and jolly Santa, the image that comes to our heads when we think of the man giving presents. Some sources, but not all, say that before Coca-Cola, Santa wore green and white clothes, but since Coca-Cola wanted to use it for their advertising, they changed the colors to red to better fit their logo. 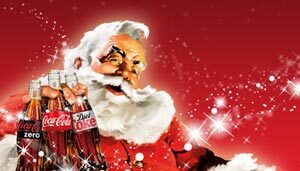 Between 1931 and 1964, The Coca-Cola Company advertised Santa delivering toys, stopping to read a letter, raiding refrigerators, visiting children and, of course, relishing a coke. The oil paintings that Sundblom painted were used for Coca Cola’s ads everywhere – from, magazines to stores, billboards to posters, and calendars to plush dolls. A lot of those items are now popular collectors’ items. The image of Christmas we now take for granted has a long and winding history and was influenced by religion, art and advertising. Now, in his current form, he is the source of much joy and happiness. Who knows what he will look like in fifty years?